Fromm Dog Food Reviews, Ratings, Recalls, Ingredients! The Fromm pet food company has been a privately owned and family food operated company since 1904. It is now into the fifth generation with Tom Nieman as the company president, owner, and head chef, since 1983. I think a pedigree like that is hard to beat! It was the first premium pet food company in the United States, and now it’s the oldest! Fromm makes all their dry dog food right in their own family-owned-and-operated plants in Wisconsin. Their low-fat treats are made there too, as well as some of the canned pet food. The rest of the cans as well as their grain-free treats are produced by USDA-inspected partner plants, also in Wisconsin or in South Dakota. You know this is a dog food brand you can trust because it has been around for so long and in the same family. You can't find quality like that in a well-known company ​anywhere else. Isn't it comforting to know your dog is eating something made by a dedicated family right here in America? Reviews of Fromm dog food are full of praise. Fromm dog food ratings are generally quite high too. For example, Review.com listed Fromm dog food as number four in their 2016 top-ten list of Favorite Dog Food Brands, behind Orijen, ACANA and Eagle Pack. The website's Fromm reviews for dog food were based on responses from a list of over 11,000 people connected to the dog food industry, as well as other pet experts, dog owners, and popular Internet articles on pet food. My own Fromm dog food rating was not negatively impacted by the company’s recall on March 18, 2016 because it was a small issue, caught by the company. It was dealt with in the right way, without problems for consumers or dogs and before there were any reports about any issues. Is Fromm A Good Dog Food? Yes, and it is all made in the USA! 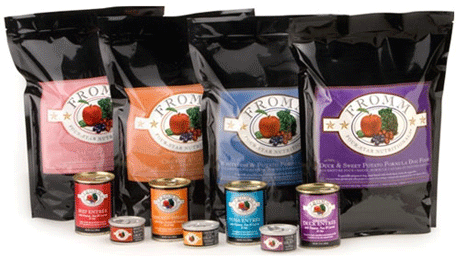 Fromm thinks of itself as an artisan company that makes gourmet, natural pet food. Every dog food line starts with real meat or fish as the first and main ingredient to provide a high quality protein source. There are also farm-fresh vegetables, eggs and cheese included, as well as prebiotics and probiotics for better digestion, vitamins, and minerals. You can be sure the nutrient profile within Fromm dog food is top notch. They have been in the business for quite some time, so they have been able to figure out what works and what does not. They are devoted to filling your dog's meal with ​the nutrition they need to live a full and healthy life. The shape and size of the kibble in each Fromm pet food line depends on the specific recipe. Different cooking methods are used to ensure a good quality for the specific product. They are also designed for the best palatability, digestibility and overall performance. Not only are all Fromm pet products ethoxyquin-free, there are no other artificial preservatives in the recipes either. The Fromm company was even involved in early research on the use of natural antioxidants like mixed tocopherols. Fromm found that they are just as good or better than artificial preservatives at making pet food last longer, and they stop oxidation too. Now many of the better pet food companies use mixed tocopherols, but this shows them as industry leaders. All of Fromm’s ingredients and suppliers meet the company’s strict requirements for the safety and nutritional value. None of them can come from China. Fromm has an Approved Supplier Program to make sure everything is tested by the suppliers and then they are sampled again in Fromm’s on-site testing labs when they arrive. There is something for every dog and every budget with Fromm pet food products. Not all the recipes are grain free, but meat, duck meal, chicken meal, lamb meal or fish is always the first ingredient. This line is still based on the original family recipe, introduced in 1942. It’s made with chicken as the main source of protein, as well as brown rice, whole eggs and real Wisconsin cheese. There are specific products for adult dogs, senior dogs and dogs who need to lose weight. These recipes use multiple protein sources, like duck, duck meal, chicken, chicken meal, fish and lamb. They’re made for specific life-stages, such as puppies, adults and seniors, as well as large and small breeds, or dogs that need to lose weight. These formulas focus on variety and are made with all life stages in mind. Every recipe is available in both a grain and grain-free version, and they are all designed for rotational feeding too. Fromm plants are USDA-inspected, and each batch of Fromm dog food is tested internally, as well as by an outside, accredited lab before shipment. However, there was a recall on some Fromm wet dog food cans on March 18, 2016 because of elevated Vitamin D.
The problem was found through their own tests and the 12 oz. cans of Gold canned dog food pates were only recalled out of an abundance of caution. The products recalled were shipped to distributors between December 2015 and February 2016. Any remaining cans can be returned to any Authorized Fromm Retailer. When I ask myself, “Is Fromm a good dog food?” My overwhelming answer is yes, even when I keep the Fromm dog food recall in mind. The Fromm company has been around for a very long time, but it continues to be a leader in the pet food industry when it comes to research. There are lots of choices for both dry and wet food too. I still trust them as a family food company, and I appreciate the quality of their ingredients. They have every kind of dog food you would need for your companion and have mastered the art of making it!